French Canadian and Italian, Benedetta Covanti is a textile & homeware designer focusing on the union of new and old techniques exploring the world of design & fashion. The unique motifs are inspired by original drawings of organic forms and textures. Colors and shapes are hand-drawn, and she digitally creates the repeated pattern to give a unique aesthetic to her work. Granddaughter of Anna Crocetti Covanti, an Italian textile designer and artist, the creations stem from Benedetta's Italian roots and her craftsmanship heritage. She is exploring the relationship between patterns & colours, and what they can create in a space, on a body, on objects or through artistic installation. She believes in design with a concept, design with a meaning, and design with our heart. She follows conceptual and slow design, while expressing an exuberance. She vows to create distinctive & meaningful textile products to appeal to our imagination and creativity. Born in France, Benedetta's childhood was filled with amazing summers spent in Fabriano, Italy with her grandparents sewing, drawing and cultivating love and beauty in all different forms. She spent the rest of the year in Quebec city, Canada with her father who was a jeweller. Her grandparents used to tell her that her drawings were Piccole Opere d'Arte, Small art pieces, so it was just a question of time before she decided to bring them to life to honor them. A life explorer, she spent 10 years exploring the design world while living in Canada, Europe & USA and worked under creative directors, fashion, surface & visual designers, sculptors, & trend forecasters. She has various experience with different brands & ateliers in Canada for MEXX, Pontbriand & Ines de Santo. In New York she worked with the Liz Claiborne Group and while doing her master in Milan collaborated with Fendi, Red valentino, Mont Blanc & Maserati. She currently lives in Montreal, Canada since 2015. Benedetta received her Bachelor of Design from Ryerson University in Toronto with a certificate in Business French. She went to pursue her Master's at conceptual school Domus Academy in Milan to learn the Made in Italy and was awarded a Master of Arts with Distinction from Wales University in UK. Anna Covanti born Crocetti in 1920 in Fabriano Italy is the paternal grand-mother of Benedetta. Raised by her grand-father, she spent lots of time with nonnes and was educated by them. They taught her their embroidery techniques and became an artigiani textile embroiderer confectioning one of a kind pieces taking several months to accomplish. While working on sur-mesures commissions, she also sold her work throughout different markets in Venice, Rome, Florence between the 1950 to 1980 across Italy. Anna had 4 grand-daughters, for whom she prepared a box filled with hand-made textiles, and passed them on to them when they grew into adulthood. For her, it was a way of passing on her legacy and her vision of textile as art into their lives. 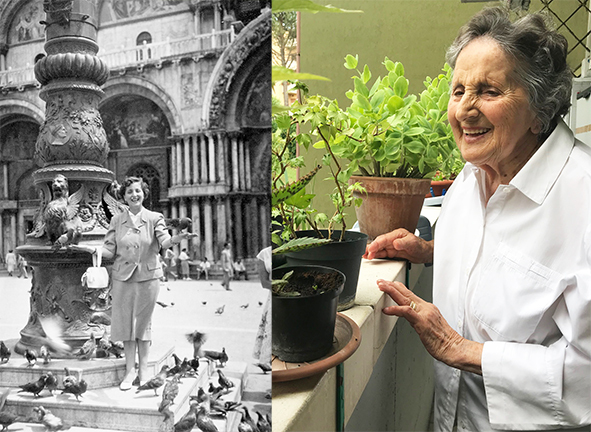 When Benedetta spent her summers in Italy, she stayed beside her grand-mother practicing her art as she kept drawings while her grand-mother kept sewing. Anna’s practice was filled with organic components, with a sweet spot for white background and durable linen. Anna past away on January 17, 2019 in Fabriano. ~ CANADA . January 18-21 . Toronto . IDS 2018 . Studio North. 2018 A Design Award & Competition. Category : Textiles, cloth and pattern. Lake Como . Italy .